Images can be added or replaced by clicking on the gray box at the top of the panel with the camera icon. Changing the Product name will update all the Variants of that Product in both Shopventory and your POS (including Bundle Variants). Categories can be edited and deleted simply by typing in the field. You can have as many or as few categories as you like. Variants can be edited, added, or deleted here. Variants have their own inventory pool and appear as their own Products at the register. SKU and Barcode fields are optional. The "Track inventory quantities" slider allows you to stop counting inventory for service Products (e.g. haircuts) or other non-inventory sales. It must be turned on to add a quantity. Adding a Bundle Variant will create a variant which draws from another Product in the inventory. If an Product is "Active" it is available for syncing out to your POS. 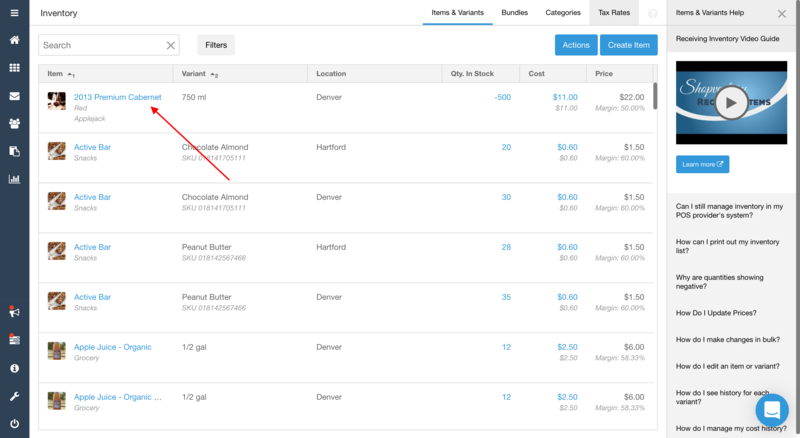 If the Product is for inventory purposes only (like an ingredient or another bulk Product), you can turn this off and it will not show up for sale. Multiple Locations can be managed here; if a location is disabled, the Product will not push out to that integration. The location and an integration must be enabled for an Product to show up for sale. If you see the words "No integrations," you can click on that to enable an integration and allow sales. List price, cost, and quantity can all be edited for each location. To turn a Tax Rate on or off, simply click on the slider. Just click Save to keep all your changes or Close to discard them! Deleted Products will still appear in sales reports and inventory reports, but they cannot be restored to your inventory page. To manage the costs and quantities of more than one product at a time, click on the "Actions" button. Be sure to leave a note when saving your changes! Bonus: To view a product's history and notes, simply click on the quantity value in the "In Stock" column. Let us know if you have questions! We are here to help!